Hooray for St Nicholas' Day! St Nicholas is celebrated as a bringer of gifts. 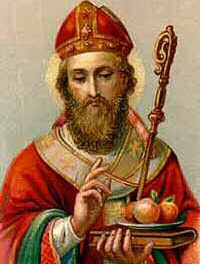 St Nicholas (270 – 343), was a historic 4th-century Christian saint and Bishop of Myra. He is also known as Nikolaos the Wonderworker and he had a reputation for secret gift-giving, such as putting coins in the shoes of those who left them out for him, a practice celebrated on this feast day. In Germany and Poland boys would dress as bishops begging alms for the poor. In Ukraine, children wait for St Nicholas to come and to put a present under their pillows. In the Netherlands, children put out a clog filled with hay and a carrot for St Nicholas' horse. In France a little donkey carries baskets filled with children's gifts, biscuits and sweets. In Italy St Nicholas is the patron of Bari where it is believed he is buried. At the Festa di San Nicola the relics of the saint are carried on a boat on the sea in front of the city with boats following. As St Nicholas is said to protect children and virgins, on 6 December there is a ritual called the Rito delle nubili: unmarried women wishing to find a husband can attend an early-morning Mass in which they have to turn around a column 7 times. A similar tradition is currently observed in Sassari, where during the day of St Nicholas, patron of the city, gifts are given to young women who need help to get married. Our modern day Father Christmas is derived from St Nicholas. Santa Claus is derived in part from the Dutch Sinterklaas, the saint's name in that language. He is the patron of sailors, merchants, archers, repentant thieves, children, brewers and pawnbrokers.